Pull out those pink polka-dotted pajamas, people: We’re going to Ballsfest! Yes, you read that right. A nonprofit organization called “Ballsfest”—a head-turning name, to be sure—is hosting a late-night pajama party at The Adelphi Hotel on February 9 from 9pm-1am. Ballsfest was founded by Frank DeBlasi, a testicular cancer survivor, who, though originally from Holmdel, NJ, has always loved Upstate New York. He’s also a huge fan of the Dave Matthews Band (DMB), and so, in 2007, decided to host a small tailgate in the Saratoga Spa State Park before a DMB concert at Saratoga Performing Arts Center (SPAC). What began as a small party for friends and family grew into a stream of annual events that raised money for Lance Armstrong’s Livestrong Foundation. 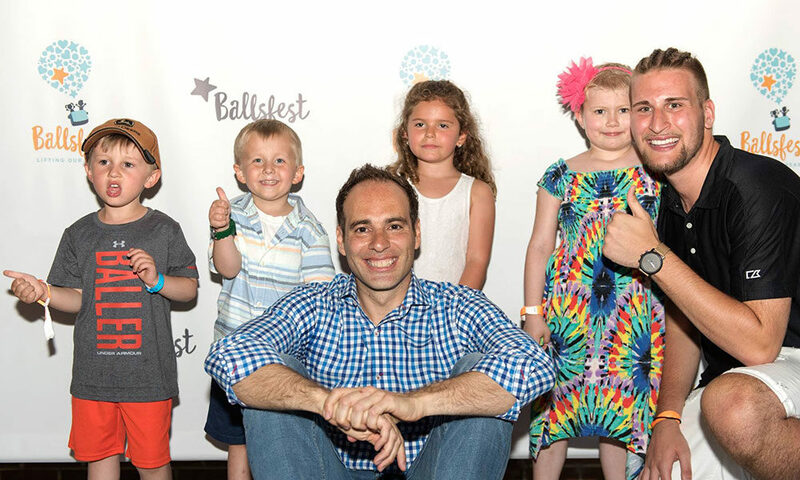 In 2013, DeBlasi and the Ballsfest team decided to shift the focus of the organization, and began using the proceeds from events for another purpose: to help local children in Upstate New York who are battling cancer. “Our primary goal, really, is to identify kids who are going through treatment and find ways to make the journey a little bit easier for them,” says Angie Silipigno, Executive Director of Ballsfest NY. They began recognizing “Ballers”—local children and young adults affected by cancer—every year at the signature annual fundraising event held in the Spa Park on “Dave Matthews weekend,” and providing them with gifts and experiences. At the 2018 event, which was attended by more than 600 people, Ballsfest recognized six Ballers, ranging in age from 4 to 22. Past Ballers have received gifts including a new piano and a year’s worth of piano lessons, a trip to Barcelona to see a favorite sports team and a new backyard playset. After ten years of positive experiences in Saratoga and New York State, Ballsfest extended its reach to Arizona—DeBlasi’s new home state—with Ballsfest West. The mission remains the same: to lift the spirits of children and young adults affected by cancer and their families by hosting events and working closely with children’s hospitals. Ballfest Arizona will be held this March at Mountain Shadows Resort in Paradise Valley, and Ballsfest Nevada has begun operating in Las Vegas, working with local resource and treatment centers. DeBlasi also has plans to begin hosting Ballsfest at the Jersey shore, bringing the organization to his home state. But back to the PJ party. Ballsfest will be renting out the entire Adelphi Hotel for its first event of 2019. Attendees will enjoy live music, food and drink, games and an evening of celebration and fun. “The purpose of this event is to raise funds to support our year-round programming and also just raise awareness of the the work we’re doing in the community,” says Silipigno. Space is limited, and interested parties are encouraged to purchase tickets as soon as possible. Regular tickets are $150; the Heart Package, which includes a welcome reception at the hotel, two tickets to the event, deluxe overnight accommodations, Ballsfest swag and a farewell breakfast, are $625; and the Star Package, which includes overnight suite accommodations, a $150 dinner gift certificate, spa treatments for two at Spa Cascada, a Saratoga local gift basket and everything in the Heart Package, is $1250. To purchase tickets, click here.